© 2018 Ubisoft Entertainment. All Rights Reserved. Tom Clancy's Ghost Recon, the Soldier Icon, Ubisoft, and the Ubisoft logo are trademarks of Ubisoft Entertainment in the US and/or other countries. Please note that the base game is required in order to play this DLC. 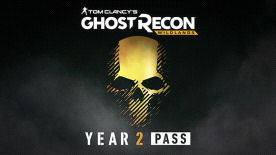 Additionally, the Season Pass is not compatible with the Steam version of the base game.